After a fun day of bonus baseball, the 2018 Major League Baseball playoff field is finally set. As we enter the wild card portion of the postseason, my simulator is super sweet on the Los Angeles Dodgers, Houston Astros and Boston Red Sox. This should remain the case through both wild card games, as both the NL and AL match-ups are rather balanced. Generally, my models like the two-seeds. My RPScore model calculates that the Milwaukee Brewers, while very good, are overseeded relative to the Dodgers, while the top-seeded, 108-win Red Sox are not quite as good as the second-seeded, 103-win Astros. My simulator does not expect big things from the Atlanta Braves or Cleveland, but can't rule anything out. Admittedly, RPScore has undervalued the Braves all year. No surprise to anyone watching this year, my numbers expect big things for the Astros and Red Sox. 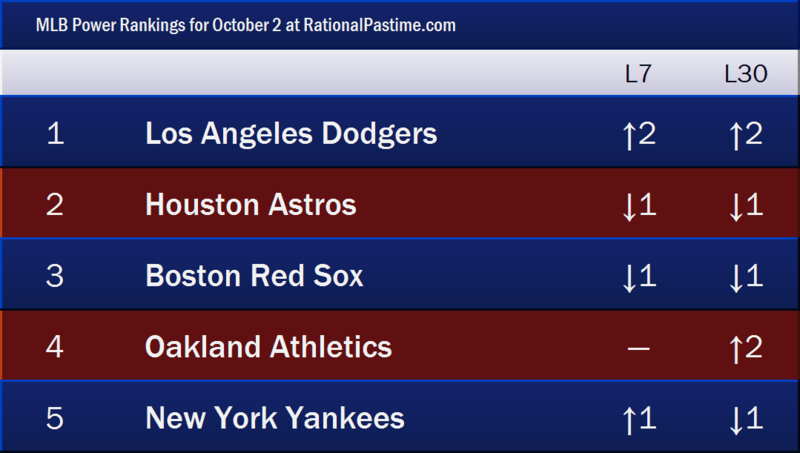 The Dodgers, however, lethargic for the better part of the first half, have charged ahead in September and October to the pinnacle of my RPScore ratings. Not pictured: in sixth place sit the Milwaukee Brewers, RPScore's pick for most improved team over the past month. For transparency's sake, here's how my simulator breaks down the final outcomes. The most likely discrete outcome is a Houston Astros repeat victory over the Los Angeles Dodgers in seven games. A fourth Boston World Series this century debuts at third place on the list, with LA showing up at fifth, Milwaukee in 19th, Cleveland at 39th, New York at 45th, Atlanta at 49th, Oakland at 60th, Chicago at 91st and Colorado at 117th. My system has felt that the Dodgers were short on luck almost the entire season. Bettors mostly disagree, giving them nearly 6:1 odds to win it all versus my 4:1 estimate. The betting market also thinks I'm too hot on Milwaukee and a bit to cool on both NL wild card teams. Markets are certainly better at picking winners than unsophisticated models like mine, but the ultimate results will be borne out on the field of play. Follow along every step of the way as we jump into yet another round of exciting Major League Baseball playoff action.